Lamb, glorious lamb I say! We are a family of lamb eaters and I say it with such pride! In New Zealand lamb is huge if you haven't heard ;) and it is lamb lovers haven. Lamb has a very edgy flavour and delicate texture when cooked well, compare it with beef and all you get is complete let down! Cheaper cuts of meat usually make a perfect hearty dish and require longer cooking time. Lamb shanks if seasoned well and cooked for the right amount of time are perfect for weekend cooking and keep well as leftovers. Lamb goes well with most veggies and is perfect with mashed potatoes. 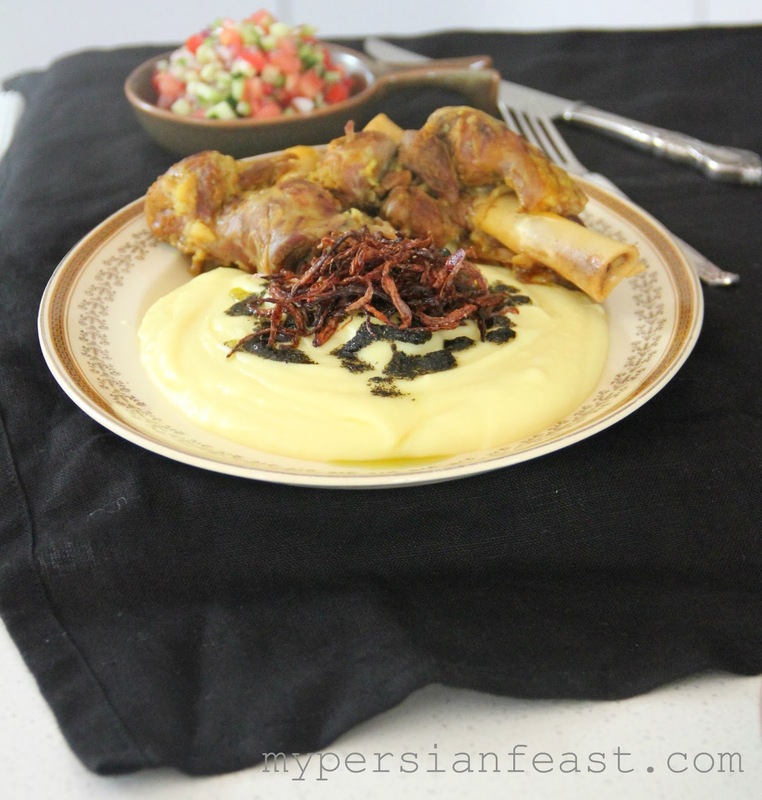 Persians eat mashed potatoes believe it or not, and it is not just a classic English food. Boiled potatoes are mashed and then fried in onions and mint leaves. A flavoursome and aromatic mashed potato with mint is perfect with lamb and we all know lamb and mint is one combo no one can argue with. As we are pressured to buy leaner cuts of meats (thanks Jamie Oliver! ), we still need fat on most cuts of meats to be able to cook perfect dishes! When choosing lamb shanks, it is best to go for the ones with slightly more fat than the leaner ones if you want the humble overlooked and uncredited lamb shanks to melt in your mouth and amaze everyone at a dinner table, it is best to stick with fatty shanks. As lamb can be quite smelly for some people, it best to marry it up with aromatic hebs. 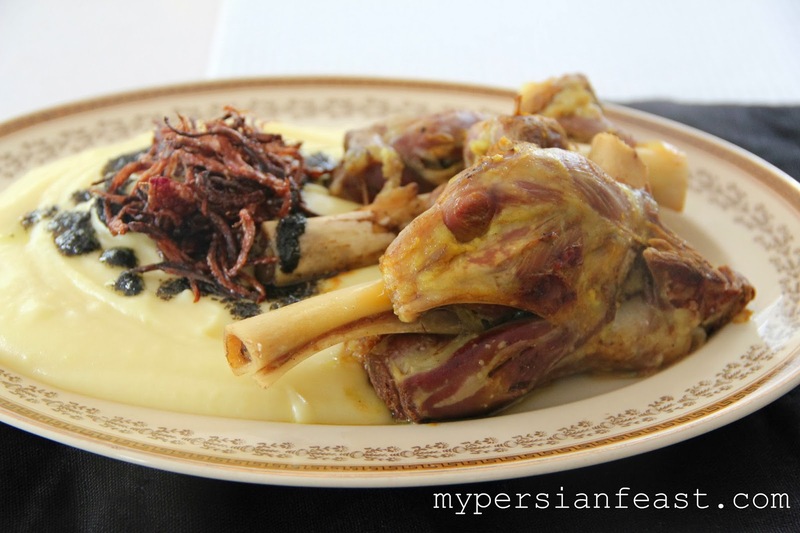 Everyone has a recipe or knows someone who can cook the best lamb shanks but a good recipe is not needed and all you need is a little patience. Saute chopped onions and garlic until golden and add the lamb shanks with a little water and simmer it until the meat is cooked. At this stage, feel free to add herbs and spices and in my case I have gone down the Persian flavour path and added dissolved saffron with lemon peel and juice with salt and pepper to season it. I have jazzed up my mashed potato with fried onion flakes and mint oil. There you go a hearty dish with help from our number one enemy 'Fat'.